Ever wanted to customise your own converse then that's exactly what you can do, although it does mean hoping onto a plane to New York and heading to their Soho store. Converse have opened a "Blank Canvas" workshop where customer can book an appointment to design their own personalised pair of sneakers. As well as this great workshop they've added more retail space to their 11,000 square feet location. The design intent was to make the space feel personal and create a prestigious experience. The in-store experience is meant to feel hands on and each customer gets one on one time with the designer as they bring their creations to life. The workshop is kitted out with a bar lined with tablets that allows the guests to sit down and scroll through fonts, patterns, logos and images. On the wall there is finished converses to give future designers inspiration for their own masterpieces, some with paint splatters, colourful laces and NYC logos. The good thing about the process is that the designs are finished and returned to the customer the same day. To have customisation you have to add $24-45 on top of the price of the shoes. Not only can you get your sneakers done but also your choice of design across a T-Shirt. Converse plan to imitate the “built-from-scratch experience that is available online by incorporating new materials and rubbers in the shoe making process as well as the customisation elements. 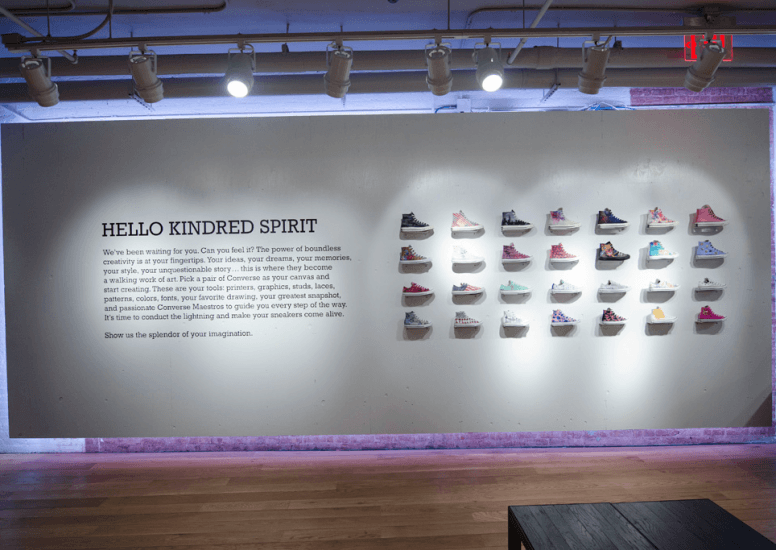 By adding an experiential element to stores has become a way of driving foot traffic, and this is something that converse have zoned in on and made it personal to New York City. A New way to book your holiday!